As 2014 winds to a close, we thought it would be fun to highlight 7 of this years hottest office makeover projects. In today's post we'll showcase our favorite boardrooms, executive offices, and guest waiting areas that are sure to spark your office design creativity. Enjoy! Talk about wow factor! This luxurious executive space is sure to impress any office visitor. Designed using Napoli furniture by Mayline, this high end work environment offers the perfect combination of modern and traditional appeal. This high tech boardroom is another modern wonder from Mayline. Highlighted by a TAC12TB TransAction series conference room table and matching mocha accent furniture, this stunning meeting area is ready for productive and efficient meetings. This year, powered conference room tables were a huge hit, and lines like TransAction were the best in the business. If you were in need of new lounge furniture in 2014, there was no better choice that Global Total Office. This loveable lounge is outfitted to perfection with Wind Linear series seating and accent tables. 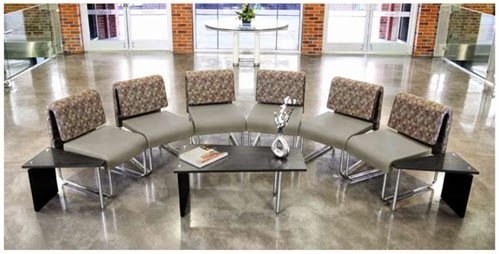 Global's wide range of upholstery options allows your design ingenuity to shine while helping businesses create one of a kind waiting areas. 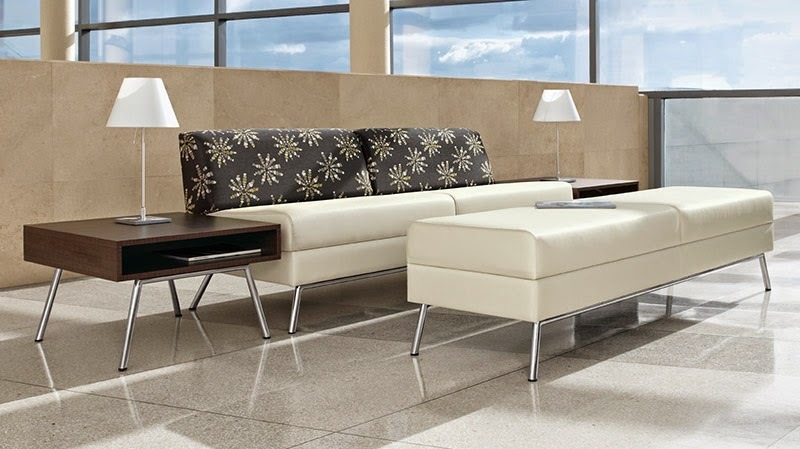 Check out this upscale modern waiting room furniture configuration from our friends at OFM. This super cool space is outfitted with UNO series seating and Profile series accent tables. 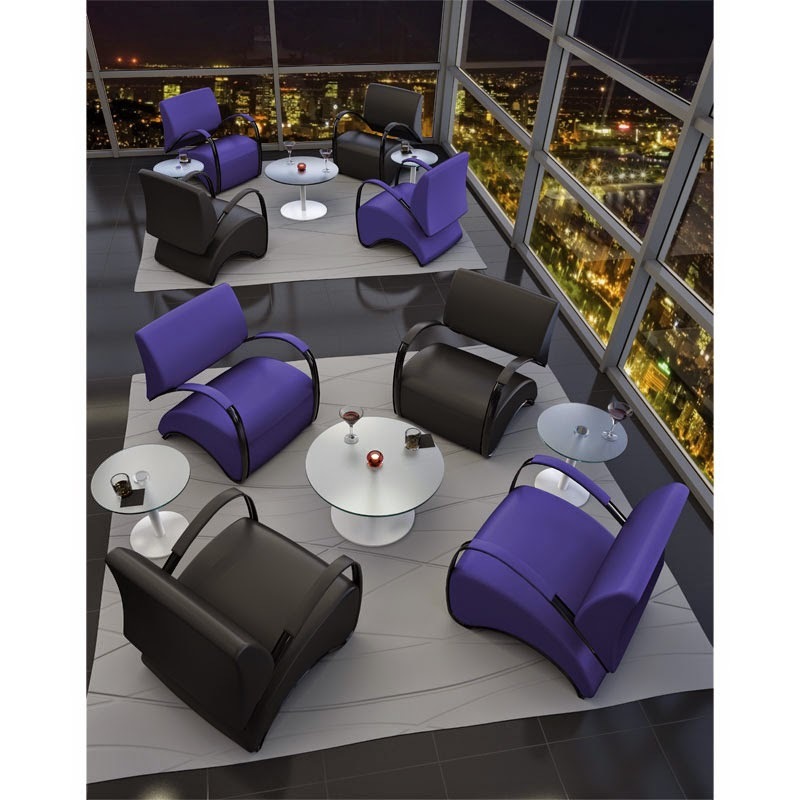 If you want your office guests to wait in style, you can't go wrong with OFM products for your project. This year Global Total Office expanded their popular Zira furniture collection by adding some of the hottest new reception desks on the market. As the reception desk is the main focal area of any business welcoming area, it's vital to make a professional first impression on your guests. That being said, Zira reception desks are more than up to the task! Another great space from our friends at OFM, this sky lounge features Recoil series lounge chairs and glass cocktail tables from the trendy NET series. This room with a million dollar view is well complimented by OFM's classy guest furnishings. The combination of purple and black chairs really pops! 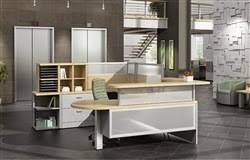 Cubicles are rapidly being left behind and replaced by high tech open desking configurations. As businesses are looking for more team oriented atmospheres, spaces like this are becoming the industry standard. Highlighted by Mayline's e5 furniture, this beautiful group desking configuration is all about collaboration and modern appeal.